Energy rubber gym flooring has a number of excellent features to enhance the look, feel and life of your sports facilities. Energy is an homogeneous EPDM / recycled rubber floor for areas subject to heavy wear. The durability, flexibility, safety, comfort, slip resistance and aesthetic appeal makes Energy the perfect solution for indoor sports flooring applications. This innovative surface has excellent sound deadening properties and is made to last the life of its application. Flexibility and permanent resiliency are the main features of Energy gym flooring. Safety is the number one concern of the Energy rubber flooring: It offers excellent slip resistance performance. It is used as a gym floor in fitness areas, weigh rooms as it is highly resistant to impact, anti-slippery and has a low maintenance. It comes in sheets (1m20x20m) and interlocking rubber floor tiles (50x50cm) and 2 thicknesses (6mm and 8mm). Available in 4 colours. The interlocking rubber floor tiles require no gluing except if submitted to important temperature changes. Energy 6 is available in rubber flooring rolls (1,20×20 m) or interlocking rubber floor tiles (0,50×0,50 m). 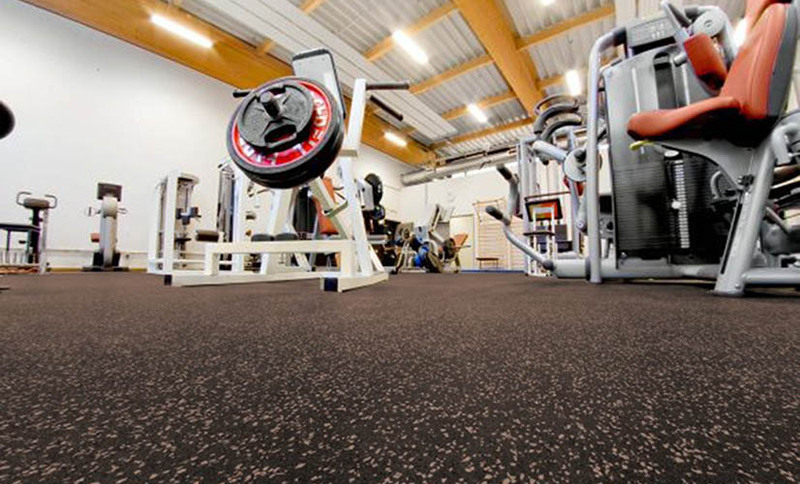 It is a perfect option when you are looking for a very strong yet economic sports flooring or gym flooring. Energy 8 is available in 8mm interlocking rubber floor tiles (0,50×0,50 m). Really strong gym flooring, easy to install. Excellent impact resistance, perfect for high intensity fitness areas, weight rooms. Very fast installation (no glue needed except in case of high temperature changes). Install Energy floor on a dry, levelled, rigid and clean sub-floor, especially in case of gluing. And at a temperature between 17ºC to 25ºC (41ºF to 77ºF). Allow the floor to acclimatise to the room for at least 24 hours prior to installation. In case of rolls, we recommend to do a floating installation the day before the installation to let the floor lay down. Locate the rolls in the same direction. The floor must be glued with a two-component polyurethane adhesive and a teethed spatula at an average of 300-400g/sqm. It is possible to install the interlocking tiles loose laid, except when they are submitted to high temperature changes. It is important to clean the floor regularly to make it last and maintain its properties. Use an entrance mats system to reduce as much as possible the level of dirt introduced in the building. Do the daily maintenance using a powerful vacuum cleaner to remove dust and loose debris. Then, clean the floor with water mixed with a pH neutral detergent (50:1) using a humid mop. Never throw water directly on the floor. For a perfect cleaning, clean area again with a humidified mop of clean water. An automatic scrubber/dryer can be used.